Discount Fiberglass Screen Mesh - Sliding screen doors, screen frame, porch screening, window screens. House-brand fiberglass screening at great prices. If you're tired of paying premium prices for fiberglass insect screening . . .
then you're on the right page. Our house-brand screening is the same quality insect screen that you will find at most hardware stores and home improvement outlets. 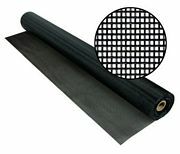 This black 18x16 mesh size is the standard for normal home improvement projects, and now even more widths are available. Each screen roll is 100 feet long.